For 7 long years the Federation and Cardassia fought a deadly stalemate on the frontier of known space. This the first campaign in the Deadly Contact Series begins with the first contact between Cardassians and the Federation, and ends with a peace treaty that will force thousands to leave their homes and spark a new war of terror. The Federation establishes an outpost on the frontier, and expands into the middle of a Cardassian civil war. 7 years after Deadly Contact the War Begins. Captain Tabitha Stewart is sent to meet a Cardassian Diplomat, only to discover a Cardassian invasion is well underway. The Federation Mobilizes for a counter-strike against the Cardassians. You lead Nova Squad a light attack wing. You are to support the liberation of Mordecai, however the plan will not goes well. The biggest and most costly battle will be fought when the Cardassians introduce a new warship. 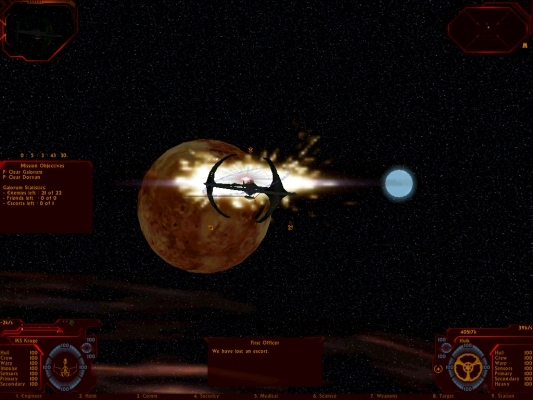 You are transferred to Special ops, and must save the galaxy from a larger interstellar war. A Klingon Rogue House attempts to kidnap a Federation Diplomat and gain Klingon support for the Cardassian cause. A Federation spy, stranded behind enemy lines is in need of rescue, and its your job to get her. Venture deep into cardassian space to save an old friend. A plan is devised to liberate the world of Bajor. But a politician threatens to leave them behind enemy lines. The Cardassians Renew their assault. Admiral Summers is confornted with his worst nightmare. The Mordecai is sent deep into enemy territory, Admiral summers is blinded by hatred and makes a fatal mistake. A Cardassian invasion fleet penetrates deep into Federation territory. Admiral Summers must contrain himself to end the War. The War is over, but now a terrorist group threatens to ignite the flames of war.